MDA is committed to maintaining a website that protects the individual’s right to privacy. We do not require personal information from our visitors, nor do we collect any personally identifying information (name, email address, Social Security number, or other unique identifier) unless you knowingly provide it. We may also collect information on what areas of our site you visit for future advertising purposes. We use the information we collect to measure the number of visitors to the different sections of our website, allowing us to make our website more useful and accessible to visitors, and for advertising purposes. Through Google Analytics, we collect aggregate, not individual, demographic and general interest data about our users for internal statistical purposes. We use this aggregate demographic and general interest data to better understand our users, for the purposes of providing better online services. For information on how Google may use this data, visit google.com/policies/privacy/partners. We may also collect personal information such as a home address, home phone number, or personal email address that you provide via email or on a request for information, registration, feedback or comment form. This information is necessary to respond to and provide the level of service your requested. We will not disclose, sell or transfer any personal information to any third party unless required by law or authorized by you to do so. By accessing, browsing and/or using this site (“Site”), you acknowledge that you have read, understood, and agree to be bound by these terms and to comply with all applicable laws and regulations. If you do not agree to these terms, do not use this Site. The material provided on this Site is protected by law, including, but not limited to, United States Copyright Law and international treaties. This Site is controlled and operated by the Minnesota Department of Agriculture (MDA) from its offices within the United States. MDA makes no representation that materials in the Site are appropriate or available for use in other locations, and access to them from territories where their content are illegal is prohibited. Those who choose to access this Site from other locations do so on their own initiative and are responsible for compliance with applicable local laws. Any claim relating to, and the use of, this Site and materials contained here in is governed by the laws of the state of Minnesota. All personal data provided to MDA through its web site will be handled in accordance with MDA’s Online Privacy Practices. You are prohibited from posting or transmitting to or from this Site any unlawful, threatening, libelous, defamatory, obscene, scandalous, inflammatory, pornographic, or profane material, or any other material that could give rise to any civil or criminal liability under the law. Unauthorized attempts to upload or change information on this site are strictly prohibited and may be punishable under applicable Federal and/or State law. Because MDA has no control over such external sites and resources, you acknowledge and agree that MDA is not responsible for the availability of such external sites or resources, and does not endorse and is not responsible or liable for any content, advertising, products, or other materials on or available from such sites or resources. You further acknowledge and agree that MDA will not be responsible or liable, directly or indirectly, for any damage or loss caused or alleged to be caused by or in connection with use of or reliance on any such content, goods or services available on or through any such site or resource. The Minnesota Grown logo is our official “trademark”. 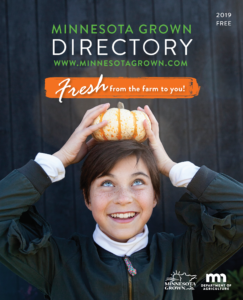 Its use is reserved for official Minnesota Grown members and retailers promoting products grown in Minnesota meet the licensing requirements put forth by state statute.